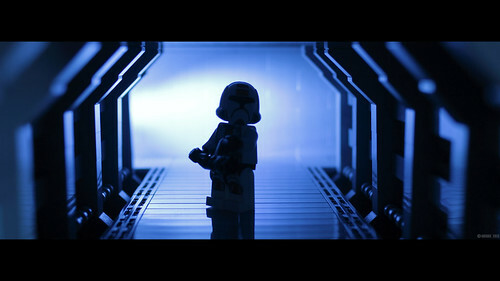 This shot is a great example of how a compelling MOC shot doesn't have to be complicated. This is a very simple setup, with nothing more than a simplistic corridor and a minifig, yet you are drawn in. The lighting isn't complicated either, just a single source. But the color, silhouetted figure, rake lit edges of the hall, agreeable depth of field and blooming background all work together for a nice shot. And it's just a test, I can't wait to see the real shots.